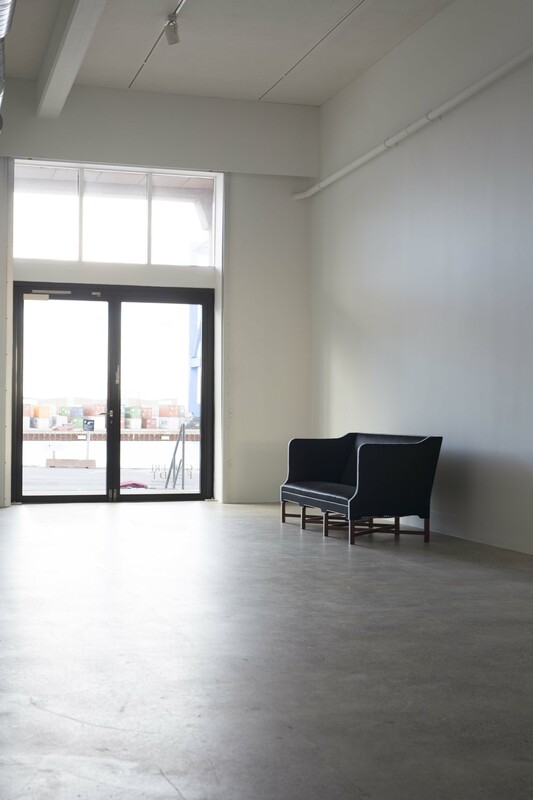 This autumn, Galleri Feldt is exhibiting several of its most exciting pieces at our gallery in the Nordhavn district of Copenhagen, which is open for visit by appointment (email info@gallerifeldt.dk to set up a time, or to request additional information, prices, and photos). The installation is a study in contrast: spanning the 1920’s to the 70’s, the exhibited works both enhance and challenge each other through differences in material, color, form, and sheer personality. 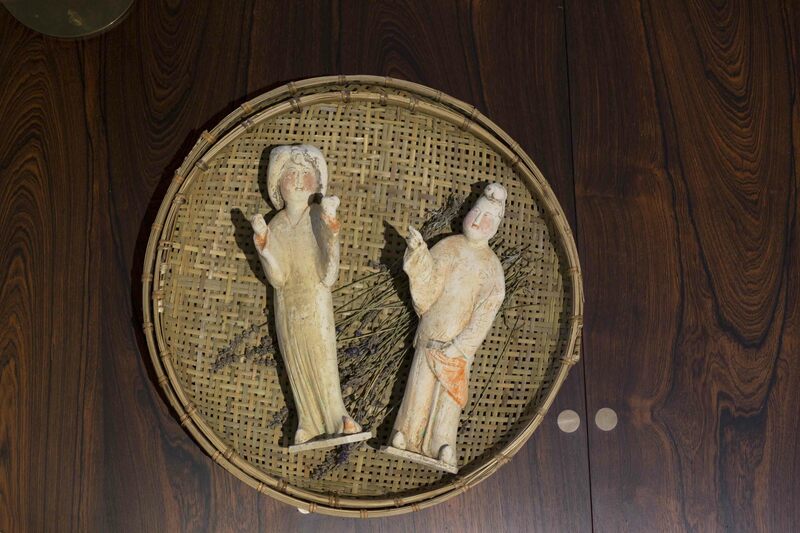 While aesthetic tension crackles between individual pieces, the ensemble is marked by unexpected harmonies and echoes. The designer who initiated Danish Modern’s penchant for experimentation was, of course, Kaare Klint (1888-1954), and the installation opens with his sofa model 4118 (1930). Klint’s approach to design was thoroughgoingly analytic: anticipating the field of ergonomics, he was the first to apply anthropometric data to furniture design as a standard of functionality. His newfangled ideas were complemented, however, by a rootedness in traditional furniture types that have proved their utility over centuries. This meeting of the classic and the novel is evident in the model 4118’s unfussily conservative, streamlined form, constructed of highest quality Cuban mahogany and horsehair. Kaare Klint's Sofa Model 4118, designed 1930 for Rud. Rasmussen, in Cuban mahogany and horsehair. Tove & Edvard Kindt-Larsen's easy chair, designed 1938 for Gustav Bertelsen, in Beech and Savak fabric designed by Tove Kindt-Larsen, 1960; with Nanna Ditzel's ‘Flowerpot’ for Oddense, 1969. 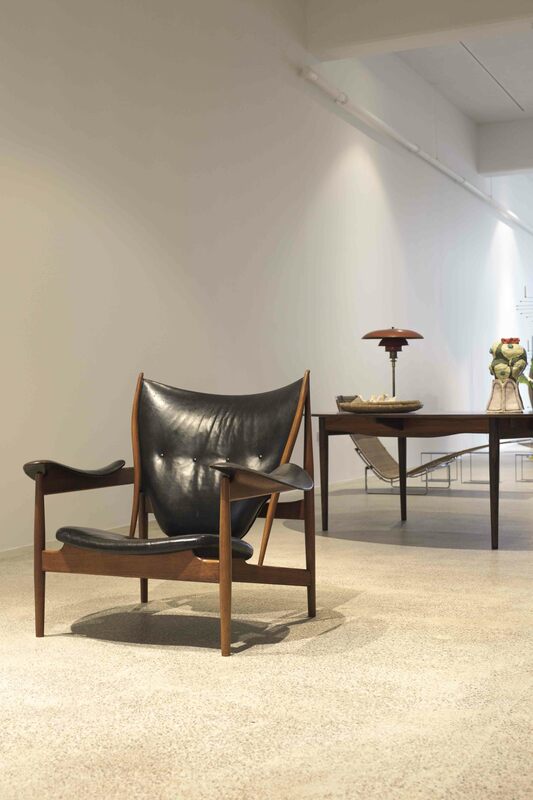 Seven years after Klint’s model 4118, a piece such as Tove Kindt-Larsen (1906-1994) and her husband, Edvard Kindt-Larsen’s (1901-1982) easy chair, designed for cabinetmaker Gustav Bertelsen, shows that the design landscape in Denmark had evolved in unforeseen directions, but that innovation was not always welcome. The gracefully plump chair featured in the Copenhagen Cabinetmakers’ Guild Exhibition of 1937, where one critic wrote that its two-colored fabric “made [it] look like a hitherto unknown [creature] with naked underframes.” Scandalized, he opined, “Many of the distinguished furniture designers…have completely turned away from the healthy course of development which characterized their early work in order to create questionable sensations…” The Kindt-Larsens’ characteristic use of contrasting colors has arguably been redeemed: in the easy chair, which is here upholstered with Tove Kindt-Larsen’s Savak wool (1960), the white helps lighten the back section and, together with the upwards-curved armrests, adds dynamism to the cuddly design. 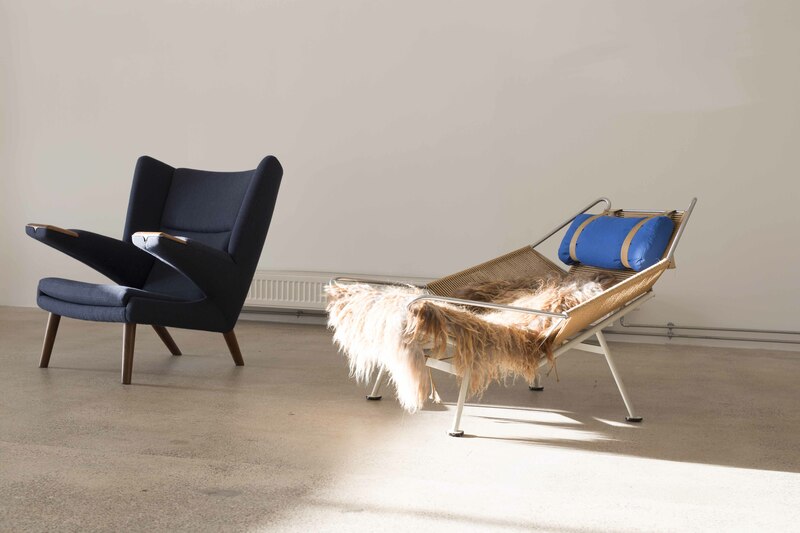 Hans J. Wegner's Mega Bear Chair, designed 1968 for AP Stolen; and Wegner's Flag Halyard chair, designed 1950 for Getama. 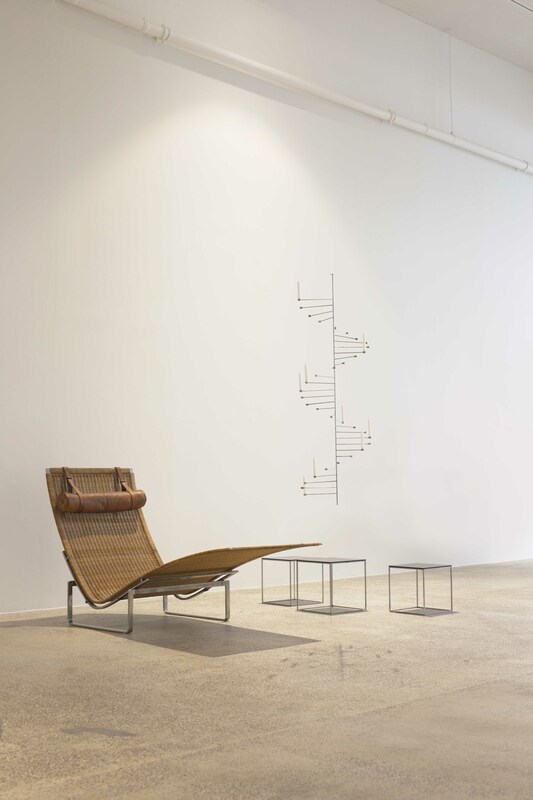 There is, perhaps, no better pair of items with which to demonstrate Hans J. Wegner’s (1914-2007) inventiveness and versatility than the Flag Halyard chair, designed in 1950 for Getama, and the Papa Bear Chair, designed in 1968 for AP Stolen. With the former, Wegner put the cabinetmaking tradition aside in favor of working with a skeletal frame of chromium plated steel pipes and a tight stringing of pleated flag halyard, creating a light, flexible cradle to sink into while swaddled in long-haired sheepskin. 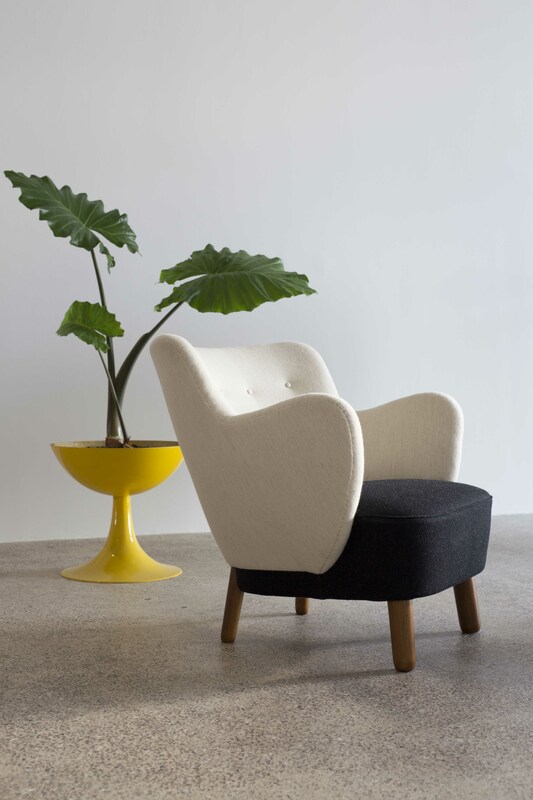 Although the result doesn’t look it, the design process was a sort of ergonomically minded fun take on Klint’s rigorous measurement practices: Wegner famously conceived of it when on a beach vacation during which he experimented with shaping the sand into a comfortable seat. 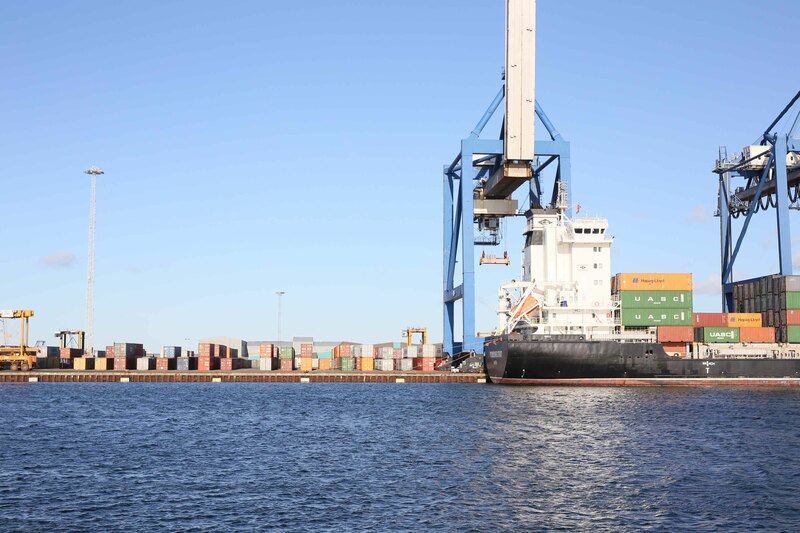 Once he formed a mold that allowed him to recline while comfortably looking around at the view, he transcribed its angles and measurements into the Halyard chair. A pair of sofas by Finn Juhl, designed 1946 for Bovirke; with Wegner's Bull Chair. Hans J. Wegner's Bull Chair, designed 1961 for Johannes Hansen. Poul Kjærholm, PK-24 chaise lounge, 1965 for E. Kold Christensen, in steel, woven cane, and Nigerian leather; with a set of PK-71 nesting tables and a PK-101 chandelier, both designed 1965. 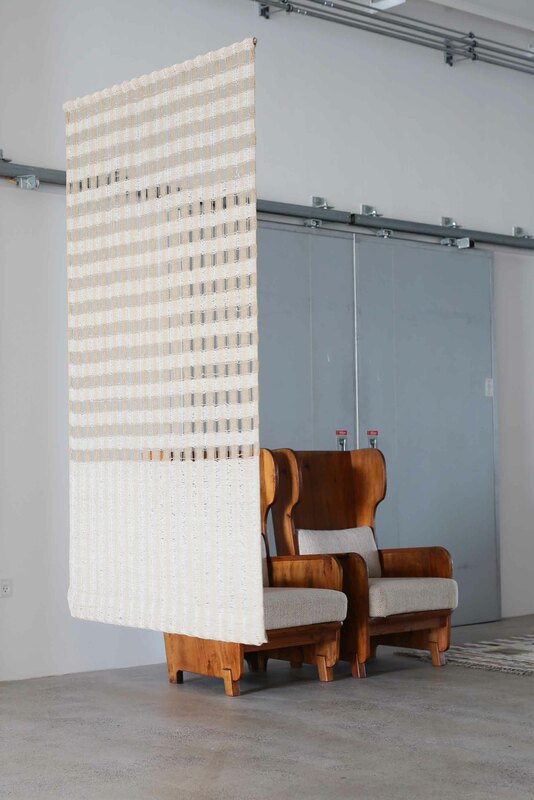 Hanne Vedel, Paris curtain, hand-woven wool and silk, ca. 1970; with a pair of Axel Einar Hjort ‘Lovö’ easy chairs for Nordiska Kompaniet, 1932. 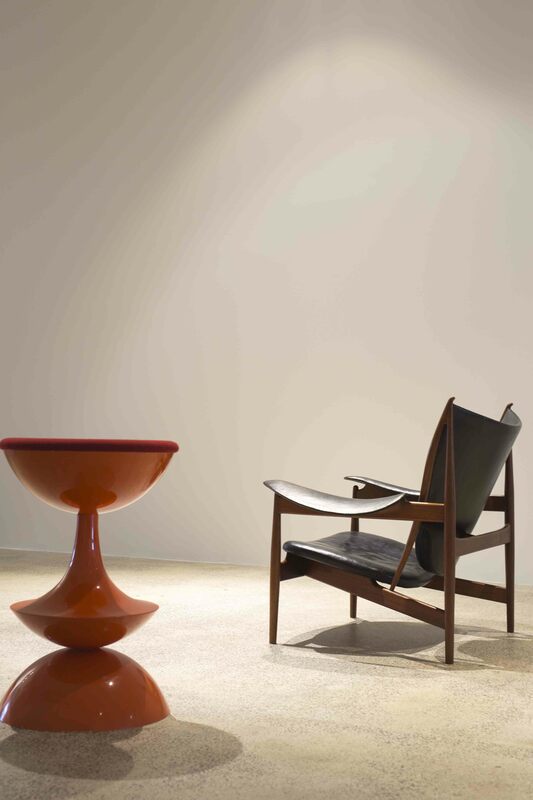 Arguably the installation’s most counter-intuitive yet fruitful juxtaposition is that between Finn Juhl’s (1912-1898) ‘Chieftain’ chair, designed for Niels Vodder in 1949, and Nanna Ditzel’s (1923-2005) Barstool in red fiberglass from 1969. With a form inspired by primitive weaponry, the Chieftain’s self-consciously masculine aura, conjuring men in heavy suits enjoying their whiskey and cigars, occupies a cultural space almost antithetical to Ditzel’s whimsical stool, which is a quintessential example of the 1960’s embrace of pop and plastic. Her use of industrial production methods in order to make furniture of mass appeal also represented a threat to the cabinetmaking tradition embodied in the Chieftain, a chair fine enough to have attracted the attention of King Frederik IX at the 1949 Cabinetmakers’ Guild Exhibition. 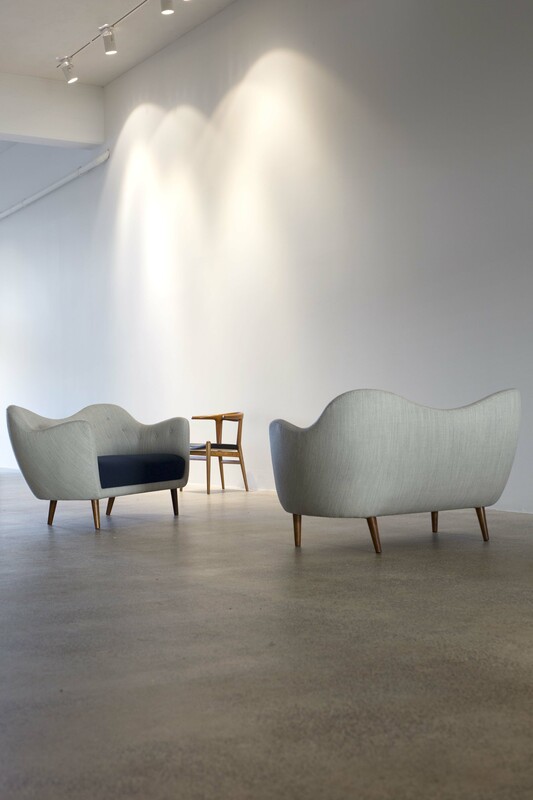 Seen together, however, their forms rhyme in a subtle way, drawing attention to the curves—for instance, in the Chieftain’s armrests and the barstool’s leg rest—that give each piece a degree of levity; and to the reflective surface textures that lend them both a polish at once figurative and literal. 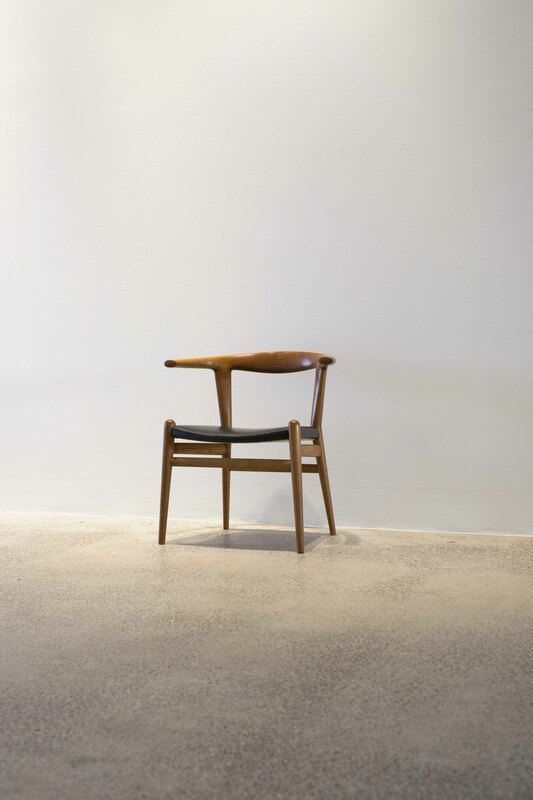 Finn Juhl's Chieftain chair, 1949 for Niels Vodder. In background: Finn Juhl's Judas table, 1949; Poul Henningsen's 4/3 table lamp, 1927; and Nico Ihlein's 'Hostile Takeover' ceramic piece, 2014. Finn Juhl's Chieftain chair with Nanna Ditzel's Barstool, 1969. 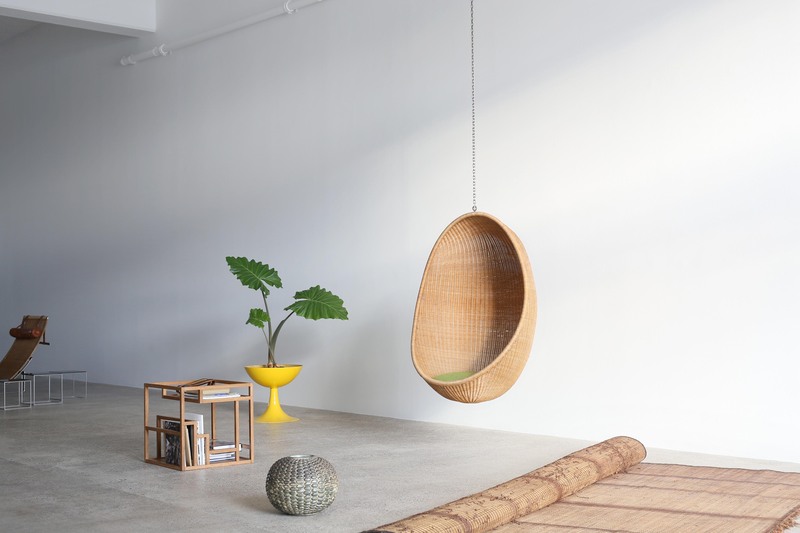 Nanna Ditzel's Hanging Egg Chair, 1959 for R. Wengler, and her Flowerpot, 1969 for Oddense; with Axel Salto's ceramic vase, 1959; and Hu Fang's ‘Home for books’, 2015.